This changing of names comes after a war of words on Twitter between the Congress and the BJP. NEW DELHI: A day after launching the "Main Bhi Chowkidar (I am a watchman too)" campaign on social media, Prime Minister Narendra Modi on Sunday changed the handle name his Twitter account to "Chowkidar Narendra Modi". In a matter of minutes, BJP president Amit Shah followed suit and also changed his account name to "Chowkidar Amit Shah". 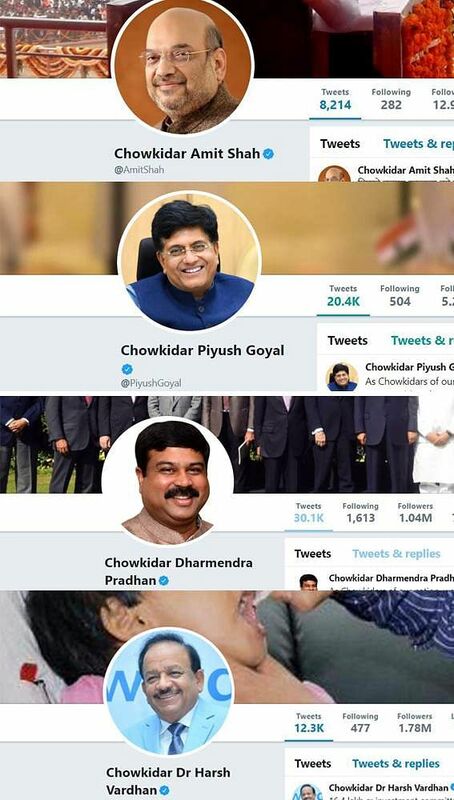 Union Ministers Piyush Goyal, J.P. Nadda, Harsh Vardhan and Dharmendra Pradhan have also followed their leaders in changing their names on Twitter accounts. BJP has also released a series of videos promoting the campaign with the tag line 'Chowkidar phir se'. Mr Gandhi has used the line 'Chowkidar chor hae (Watchman is the thief)' to take forward his campaign against the Prime Minister on Rafale aircraft deal with France.